The Lone Star Rangers was published in All-Story Cavalier Weekly, 5 part serial beginning with v31 #2, May 9, 1914. Harper & Brothers were not completely happy with the story as it stood. When they saw Zane Grey’s new story The Last of the Duanes they cut it with nearly 90,000 words due to what they saw as too much violence. In its strongly edited form The Last of the Duanes was published in The Argosy, September of 1914. What Harper & Brothers, New York then did was to combine these two stories into the story that most people have come to know as The Lone Star Ranger in 1915. In 1917 the story The Lone Star Ranger was also released on GRIT in October. For this reason, readers of The Lone Star Ranger will find that inexplicable changes happen to the story and it flows rather poorly at times. Despite this it was a best-seller back in the day and because of this I recommend that you get Last of the Duanes. “It may seem strange to you that out of all the stories I heard on the Rio Grande I should choose as first that of Buck Duane—outlaw and gunman. In the North and East there is a popular idea that the frontier of the West is a thing long past, and remembered now only in stories. As I think of this I remember Ranger Sitter when he made that remark, while he grimly stroked an unhealed bullet wound. And I remember the giant Vaughn, that typical son of stalwart Texas, sitting there quietly with bandaged head, his thoughtful eye boding ill to the outlaw who had ambushed him. Only a few months have passed since then—when I had my memorable sojourn with you—and yet, in that short time, Russell and Moore have crossed the Divide, like Rangers. As the story begins, we meet Buck Duane the last of the fighting stock of the Duanes of Texas. Cal Bain has come to town with blood in his mind and Buck’s uncle fears that if the two meet gun-fighting with occur. His uncle worries that a meeting between the two will end up with Buck being hanged. But like most young people, experience is often the only way to learn. Buck does not listen to his uncle. Suddenly Buck finds himself an outlaw and in the company of another one by the name of Stevens. The line between outlaw and lawman was often blurred in the days of the Wild, Wild West. Some of the lawmen had been outlaws and some of them weren’t really firm in their lawfulness after becoming Rangers or sheriffs and their ilk. Duane’s role in Last of the Duane’s is one of a vigilante. He doesn’t want to live a life of crime, yet killing people seems to be the only thing he is good at. One consequence of this is the many deaths Duane sees during the novel. But another consequence is his need for some sort of redemption. While he has no regrets for killing the people he kills, Duane does want the killings to count for at least something semi-good. When the need to rescue the young girl, Jennie, from a gang leader and that leader’s wife the opportunity for redemption comes to Duane’s life. How it all ends for him is a good question. “Jennie, run out! Get on a horse!” he said.Jennie flashed out of the door. With an iron grasp Duane held to the rifle-barrel. He had grasped it with his left hand, and he gave such a pull that he swung the crazed woman off the floor. But he could not loose her grip. She was as strong as he. He tried to intimidate her. She did not see his gun thrust in her face, or reason had given way to such an extent to passion that she did not care. She cursed. Her husband had used the same curses, and from her lips they seemed strange, unsexed, more deadly. Like a tigress she fought him; her face no longer resembled a woman’s. The evil of that outlaw life, the wildness and rage, the meaning to kill, was even in such a moment terribly impressed upon Duane. He heard a cry from outside—a man’s cry, hoarse and alarming. It made him think of loss of time. This demon of a woman might yet block his plan. “Let go!” he whispered, and felt his lips stiff. In the grimness of that instant he relaxed his hold on the rifle-barrel. With sudden, redoubled, irresistible strength she wrenched the rifle down and discharged it. Duane felt a blow—a shock—a burning agony tearing through his breast. Then in a frenzy he jerked so powerfully upon the rifle that he threw the woman against the wall. She fell and seemed stunned. Duane leaped back, whirled, flew out of the door to the porch. The sharp cracking of a gun halted him. He saw Jennie holding to the bridle of his bay horse. Euchre was astride the other, and he had a Colt leveled, and he was firing down the lane. Then came a single shot, heavier, and Euchre’s ceased. He fell from the horse. A swift glance back showed to Duane a man coming down the lane. Chess Alloway! His gun was smoking. He broke into a run. Then in an instant he saw Duane, and tried to check his pace as he swung up his arm. But that slight pause was fatal. Duane shot, and Alloway was falling when his gun went off. His bullet whistled close to Duane and thudded into the cabin. Duane bounded down to the horses. Jennie was trying to hold the plunging bay. Euchre lay flat on his back, dead, a bullet-hole in his shirt, his face set hard, and his hands twisted round gun and bridle. He caught his bridle out of Euchre’s clutching grip and leaped astride. The frightened horses jumped into a run and thundered down the lane into the road. Duane saw men running from cabins. He heard shouts. But there were no shots fired. Jennie seemed able to stay on her horse, but without stirrups she was thrown about so much that Duane rode closer and reached out to grasp her arm. Thus they rode through the valley to the trail that led up over, the steep and broken Rim Rock. As they began to climb Duane looked back. No pursuers were in sight. “Jennie, we’re going to get away!” he cried, exultation for her in his voice. She was gazing horror-stricken at his breast, as in turning to look back he faced her. 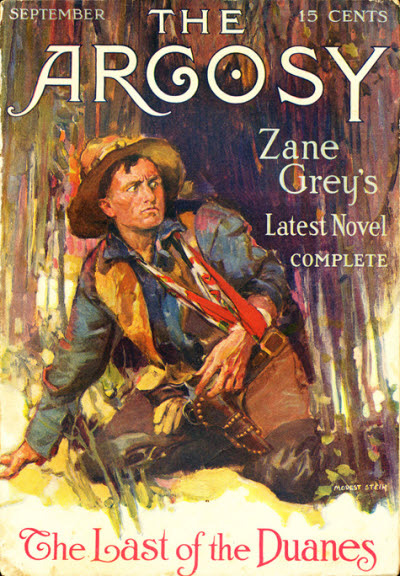 it as Zane Grey’s definitive study, not only of the bloodshed and gun play true of the old West, but also a depiction with great insight of the inner turmoil of a man indirectly made an anti-hero by his actions, one who struggles not only with his own violent nature but with his past in his final hope to achieve redemption as a Texas Ranger.